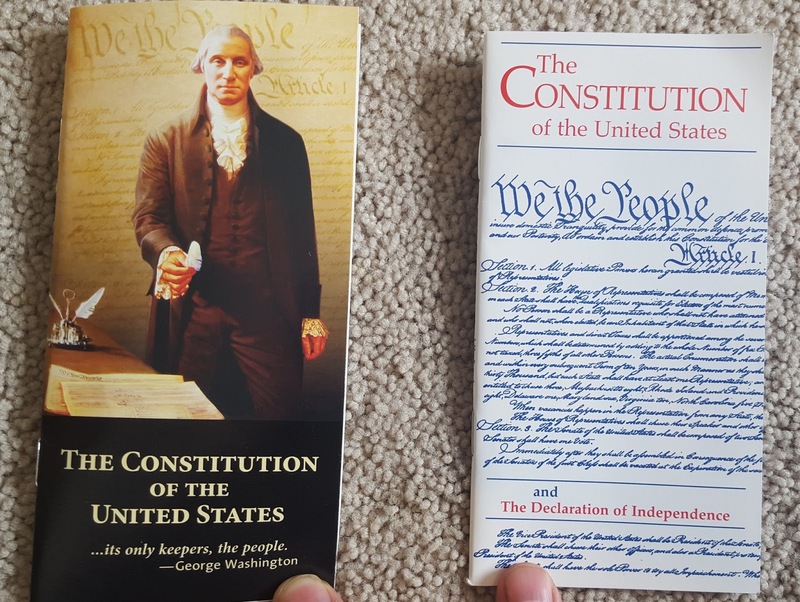 "proofed word for word against the original Constitution housed in the Archives in Washington, D.C."
What Amazon does not tell you, unless you read far down into the less favorable reviews, is that the one on the left includes commentary and selective quotes from the Founding Fathers in support of the extreme, right-wing agenda of the publisher, the National Center for Constitutional Studies, successor in interest to W. Cleon Skousen's Freemen's Institute. There are even ads in the back for more publications of the NCCS. It's not as bad as it could be. I was hoping for a thoroughly annotated copy of the Constitution to help explain what the heck the Skousenites are actually talking about. But the message is clear from the proof-texting and cherry-picking of the Founding Fathers (and Daniel Webster, a later Whig, for some reason) that they are promoting a religious agenda associated with the Constitution and the doctrine of original intent/wording that "has lost its meaning with many of our elected leaders." It is political propaganda of a certain viewpoint. That's all fine and good except when it helps lead to the armed take-over of a public facilities managed by the United States Fish and Wildlife Service under federal law and the Constitution. And worst of all, it may have led to the violent death of LaVoy Finicum who was in the wrong place at the wrong time doing the wrong things (i.e., clearly running a road-block and fleeing from an arrest warrant and apparently reaching for a weapon rather than clearly surrendering to the Oregon State Police). W. Cleon Skousen was a fraud to the extent he may have portrayed or allowed himself to be portrayed as J. Edgar Hoover's "right-hand man" a "special FBI expert on Communism," and "tasked by Hoover to lecture and write against Communism." The FBI had so many Freedom of Information and other requests to confirm these allegations about Skousen that they have a web page with a pile of documents providing Skousen's personnel file, the standard response of the FBI denying the above allegations, and the FBI's actual monitoring of Skousen as a person of interest for whatever reason. (Hoover used to do that a lot especially when his name was being used in vain). I draw no conclusions with regard to Skousen's purely religious writings or his person. As my missionary son just wrote home, "I don't believe there is a single bad person in the world, just bad decisions." Skousen is now the revered philosopher of not just the Malheur armed occupants but of Media Star Glenn Beck, Presidential Candidate Dr. Ben Carson, and Utah Legislator - Lobbyist - and Past President and now CEO of the American Lands Council Ken Ivory. These three people built their political philosophies on the apparent fraud of Skousenism. If you want to read something even more unpleasant, check out what the Southern Poverty Law Center says about Skousen and the NCCS. Signs that Your Friend May Be a "Sovereign Citizen"
"O'er all the tomb a sudden spring" Happy Easter! So Happy to See a Black President!